Singapore-registered MT Joaquim which went missing in Selangor waters last night has been found some 14 nautical miles east of off Pulau Rupat, Indonesia. 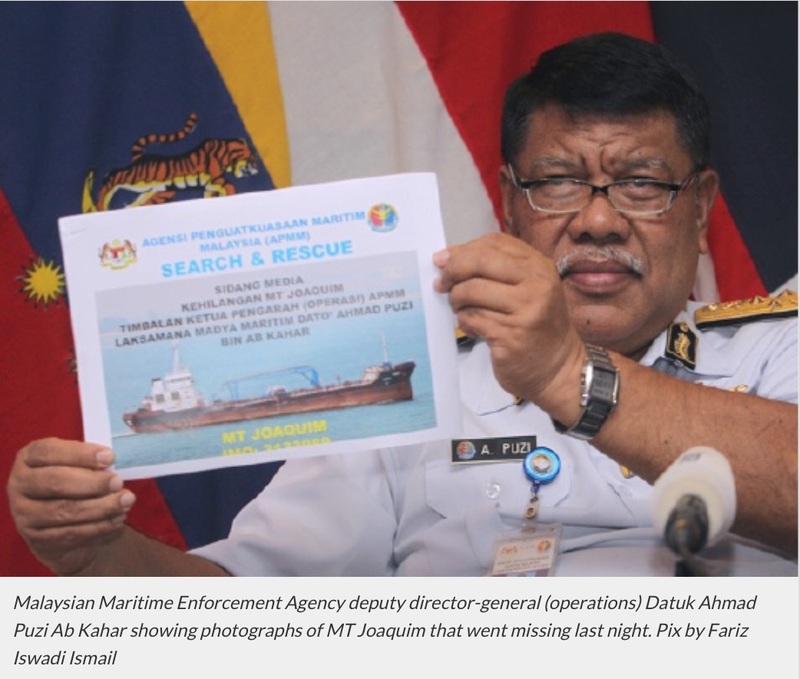 Malaysian Maritime Enforcement Agency deputy director-general (operations) Datuk Ahmad Puzi Ab Kahar said the oil tanker was transporting 3,500 metric tonnes of fuel oil worth USD700,000 (RM2.7million). “MT Joaquim was sailing from Tanjung Pinang, Indonesia to Langkawi Island when it went off the radar at 9.35pm. “A total of 15 ships, 9 boats and 4 aircrafts were immediately deployed to the search area at Malacca Straits, including assets from Singapore, Thailand and Indonesia. “A Bombardier CL 415 detected the vessel at 8.45am. The vessel had been released but the cargo has disappeared, believed to be stolen by the hijackers. “We believe that a phantom ship was involved in this case and investigation is still ongoing,” he said at a press conference, today. At the moment, the vessel is still anchored at its position as it is facing technical difficulties. Puzi said there was a possibility that an “insider” was involved in the hijacking as the oil tanker was supposedly heading north but had changed course to a southern direction. On board the oil tanker MT Joaquim were 10 crew members, 9 of which were Indonesians and one Singaporean. Puzi said two of the crew members suffered minor injuries and were evacuated to receive medical attention at Malacca hospital. MT Joaquim was scheduled to arrive at Pulau Langkawi at 3am today.